LINKS & TEE’S Golf Dome. The best deal in DuPage, Open today from 8 AM to 10 PM, great rates, come in now for the outdoor golf season tune up lesson. 880 West Lake Street in Addison see Addisonparks.org. 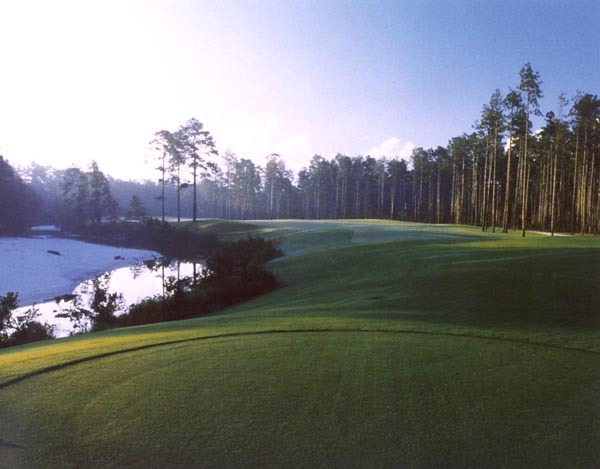 WANNA GOLF AWAY, destination golf is yours in Mississippi, try the Biloxi area for starters. See VisitMississippi.org for details on great southern golf and more. BY: Rory Spears, Editor & Director of Content. Follow Rory on Facebook, Linkedin & Twitter @GogBlogGuy. 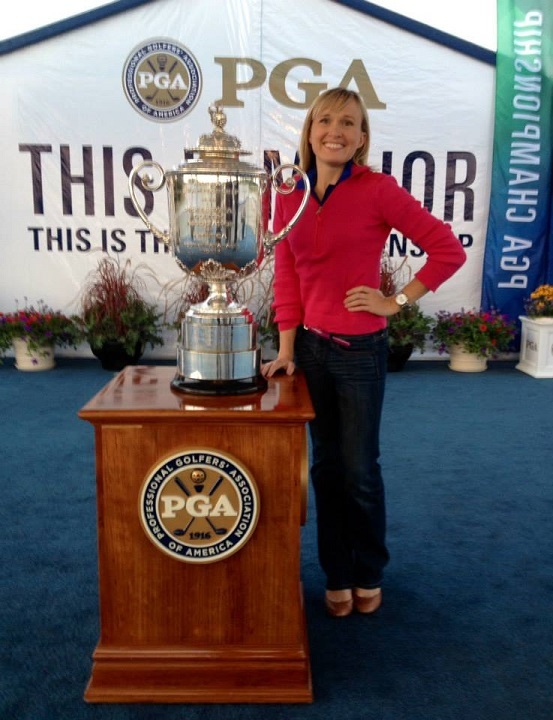 Artwork by famed Kohler area painter Cassy Tully, has been selected as the Official 2015 PGA Licensed Merchandise. Above the Whistling Straits clubhouse. This coming August the PGA Championship will visit Wisconsin’s Whistling straits for the third time. 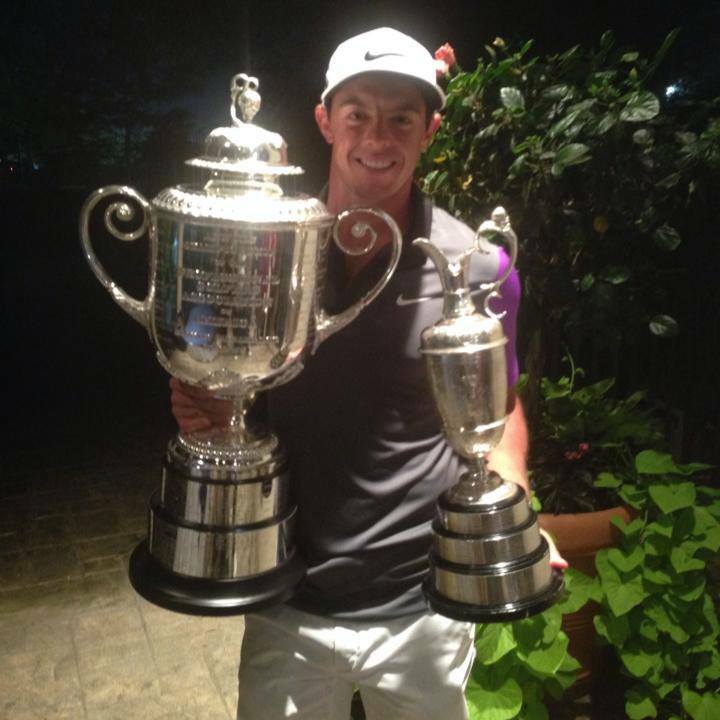 Defending champion Rory McIlroy will try to win his third PGA Championship in just four years. From August 10th through the 16th, more than 150 professional golfers from around the world will compete for the title, on the Pete Dye designed golf course located in Haven Wisconsin (near Kohler). Whistling Straits has hosted the PGA Championship in 2004 and 2010, while hosting the U.S. Sr. Open in 2007. 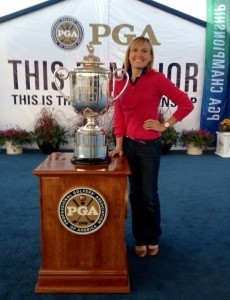 Artist Cassy Tully with the Wanamaker Trophy. Plymouth Wisconsin based artist Cassy Tully, has had her artwork selected to be the 2015 Official PGA Licensed Merchandise. Tully is still creating the Whistling Straits Par 3, Seventh Hole that over looks the Lake Michigan coastline. Reproductions of the painting will be released this spring as 2015 PGA Championship Official Licensed posters. Whistling Straits-Clubhouse is available as a 12″ x 24″ commemorative signed print bearing the official PGA logo for $50. This print is included in the corporate merchandise program and available in dual-logo print. The original 24″ x 36 ” masterpiece is currently on display at the Whistling Straits clubhouse, it is available for purchase at $12,000. In addition to the complete collection of Sunrise on the Straits artwork, the Straits Clubhouse original painting and prints are available at the Whistling Straits Clubhouse and online at Kohlerathome.com. Visit PGA.com for more information on the PGA Championship. Tully’s new studio is located in downtown Plymouth just a few miles west of Kohler and the American Club. For more information on Cassy Tully art or getting an original painting that is available upon request. See cassytully.com or email info@cassytully.com. Cassy Tully fine art is located at 437 E. Mill Street, Suite B in Plymouth Wisconsin. (920)-698-6201. Hours M-F 10 AM to 5:30 PM, Saturday 10 AM to 3 PM. For more information on the PGA Championship or tickets to the tournament, visit PGA.com. BEST DEAL IN DUPAGE for indoor golf. 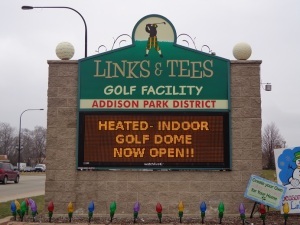 Links & Tee’s Golf Dome 880 West lake Street. Open today from 7 Am to 10 Pm. Get that tune up lesson just in time for the summer season. Visit Addisonparks.org or call (630)-233-7275 Ext. 4. Warm weather will be here soon. THE GOG BLOG, by Rory Spears, Editor & Director of Content. Follow Rory on Facebook, Linkedin & Twitter @GogBlogGuy. With Brian Henninger at the Grand Bear Pro-am. Mississippi was one of the 13 states I had not played golf in, but as of last week the number is down to 12. What a week it was, great hotels, great food, and great golf to top it all off. Two pro-am spots in one week, playing in a tour pro am is such a great experience. I hope that everyone who enjoys golf gets that chance some day. It’s even better when you get two great professionals as I did to play with. Both Brian Henninger and Joey Sindelar could not have been better. One piece of advice, if you play in a pro am don’t get caught up in getting the biggest name. That doesn’t always mean the best experience. The Par 4, 17th hole at Grand Bear. A look at my opening tee shot of the round. I really didn’t know what to expect in Mississippi, I spent my time around the Biloxi area. No complaints, it was much better than expected. I know that Mississippi isn’t regarded as a golf destination state, but it should be. It doesn’t have as many golf courses as states like Florida and the Carolina’s, but it has it’s share and I found them to be pretty good. 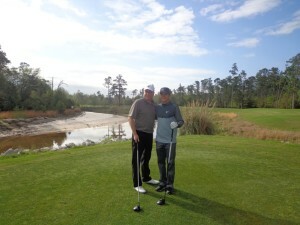 The pro’s in the gulf coast area will tell you that there is, golf to played over 300 days a year. Some of those off days are in what we call summer, up in here in Illinois. It just gets a bit too hot and steamy at times down South in July and August. 1990 Hardee’s Classic (now John Deere Classic) Champion Joey Sindelar could not have made our groups pro am experience any better. My trip included seeing five golf courses, four of them I would play again anytime. One course has gators that are probably chewing on about nine of my Titleist Pro-V1x’s, need I say anymore. 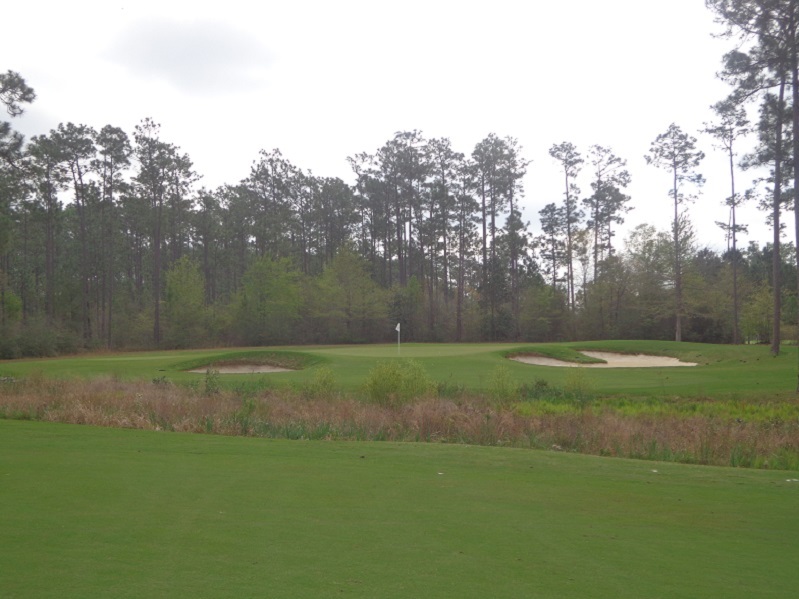 The other four courses that include The Preserve by Jerry Pate, Shell Landing by Davis Love III, Grand Bear by Jack Nicklaus, and Fallen Oak by Tom Fazio were outstanding and should be on any golfers hit list that visits Mississippi. When I first mentioned my trip to a few fellow media golfers I know, they all asked me if I was going to play Dancing Rabbit and or Old Waverly. After seeing pictures of both of those courses, I’m sorry to say I didn’t. But it gives me good reason to return. Minor league baseball is returning to the Biloxi area. For our readers from Wisconsin you might pleased to know that, the Biloxi Shuckers a Milwaukee Brewers AA team has a new stadium going up right on the gulf. The new stadium is part of the rebuilding in the area, that still continues some 10 years after hurricane Katrina pounded the area. But what Katrina did in the big picture, was give the entire area a chance for a fresh start. New hotels, improved golf courses, restored historical restaurants are back and better than ever. 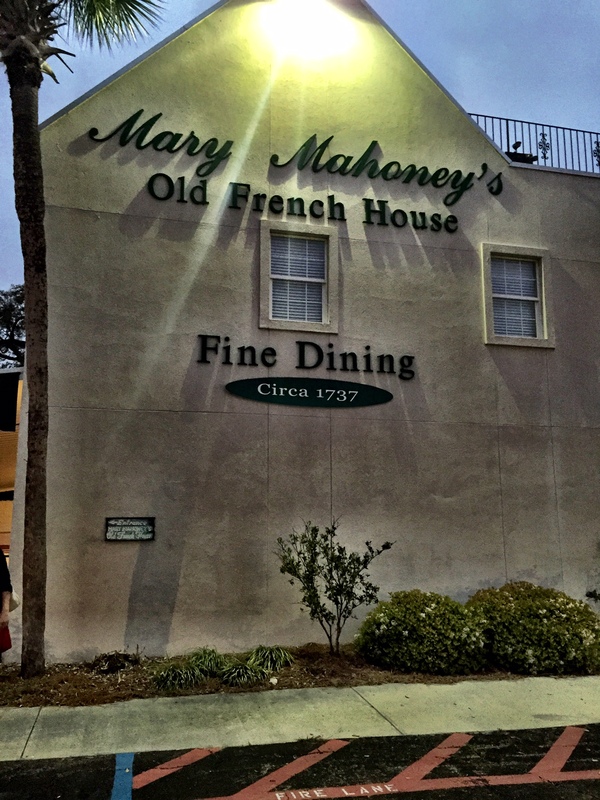 Mary Mahoney’s has a long history that’s matched by very few restaurants in America. For the best in dining, it starts out at 32’s. The restaurant on the top floor of the IP hotel and casino. A good variety menu, and the food was even better. Our food tour didn’t stop there. Mary Mahoney’s Old French House is celebrating it’s 51st year in the this historic home site. It was closed for 65 days after Katrina invaded and left water ten feet high inside. The pictures of the famous who have visited line the walls inside. It’s a sea food lovers haven, but if you can’t eat sea food (like me) no worries. The baked bread, salads, list of steaks, and fine deserts will fill you up. Our group of golf travel people left that night, feeling stuffed. But then that happened quite a bit on this trip due to the amount of places we visited that serve great food. You will not go hungry in Biloxi. 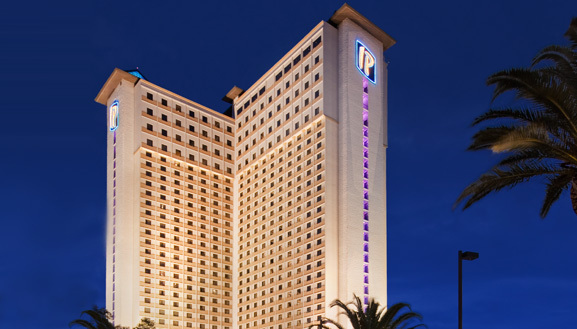 There are plenty of great places to stay in the Biloxi area. You can find all of the chain hotels you see across the country or if you wish for more, hit the casino-hotels that have sprung up in the area. I stayed two nights at the IP, and two more at Beau Rivage. The IP is about a half mile off the gulf, but right on a water inlet. The suites are the biggest you’ll ever see, and having 3 TV’s in the bathroom is something I wouldn’t mind on a regular basis. My room at the Beau Rivage was pretty “sweet” as well. Nice view of the beach’s and the gulf right below. The Beau is right across the street from the new stadium going up for the Shuckers AA (Brewers) baseball team. The new home of the Shuckers AA Milwaukee Brewers baseball team. I know when golfers think about golf destinations, its Florida, Arizona, Hawaii, Myrtle Beach, Charleston, Hilton Head, Bandon Dunes, Pinehurst, Pebble Beach, and a few other places. THE BEST DEAL IN DUPAGE, is the award winning Links & Tee’s Golf Facility on Lake Street in Addison. Outdoor golf season is right around the corner, get your spring tune up lesson in before it’s too late. Call (630)-233-7275 Ext. 4 or visit Addisonparks.org. VisitMississippi.Org Golfers on Golf is written by Rory Spears, Editor & Director of Content. Follow Rory on Facebook, Linkedin, & Twitter @GogBlogGuy. 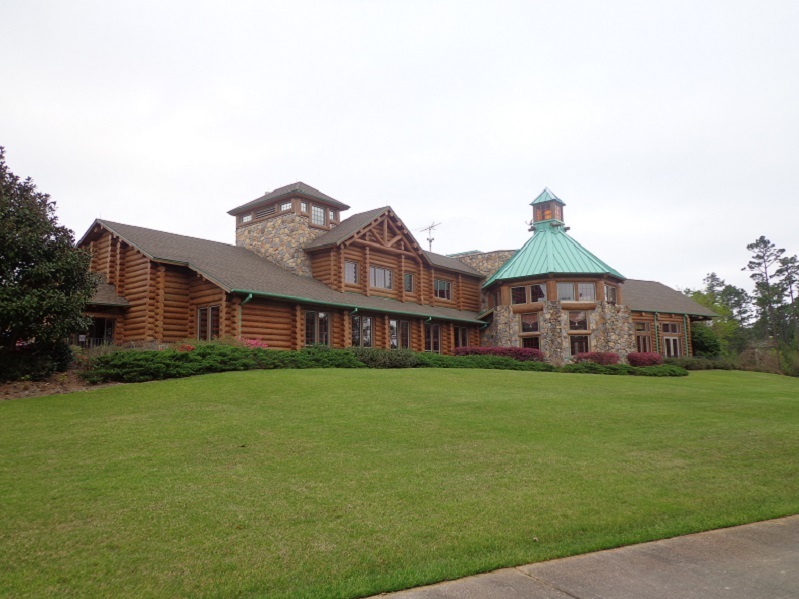 The clubhouse at the Jerry Pate designed golf course, The Preserve. 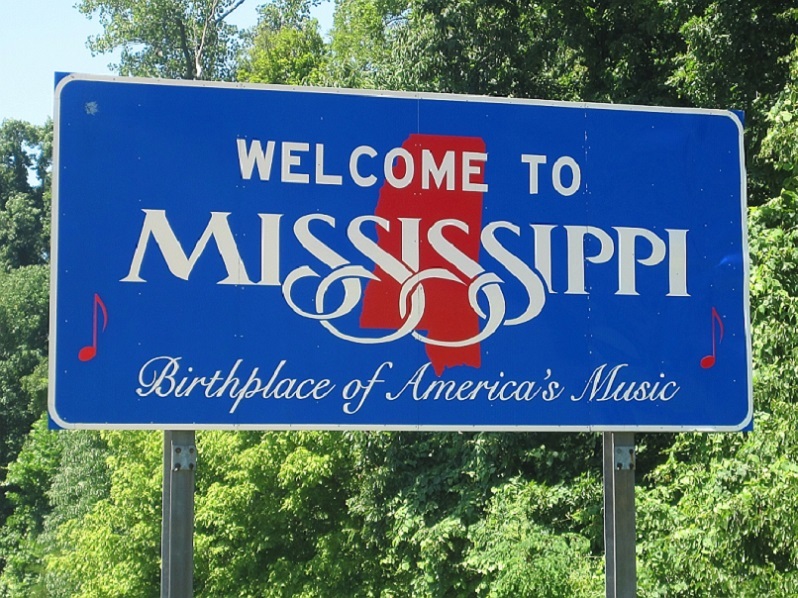 VISIT MISSISSIPPI, Golf in the Gulf is continuing to grow, as more golfers learn what there is to offer in the state that’s the birthplace of America’s music. The trail of golf courses that runs through the Mississippi area continues to grow. 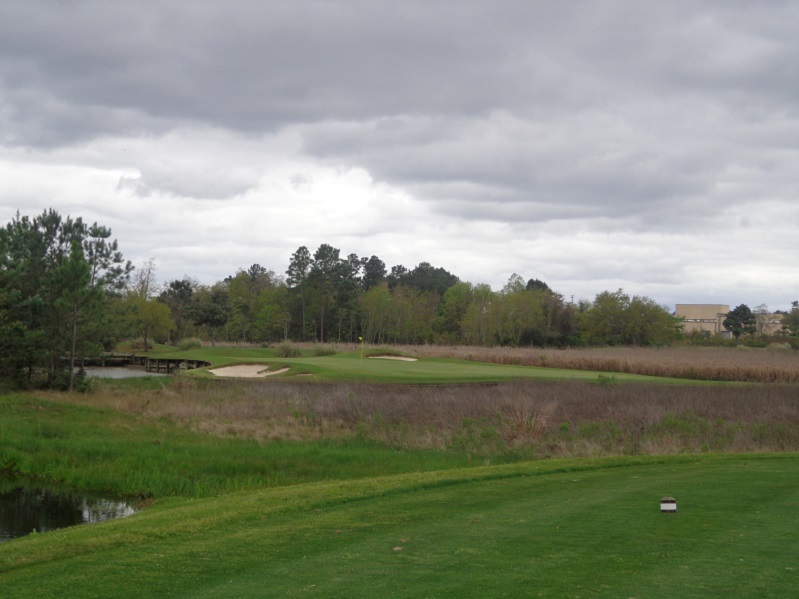 While a neighboring state has a trail by only one architect, Mississippi has a wide range of architects all with views on how to, build a great golf course. 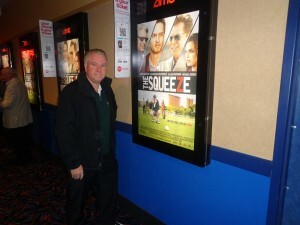 With the reviews that have come in so far, they are all succeeding. That is good news for the golfer that wants to play gulf area golf. 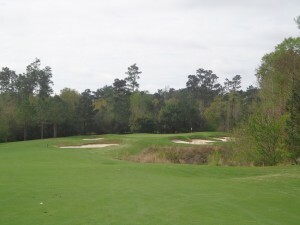 The 225 yard Par 3, 16th hole at the Preserve. All around the Biloxi area great courses are popping up, some have been around for a while but for one reason or another, you haven’t heard of them. Some got lost in the shuffle after Hurricane Katrina, some needed time to get back on track and used the time to rebuild a better product. The Mississippi Gulf Coast area is an emerging golf and gaming destination, it still might not have as many golf courses as some other states but what they offer stacks up against other known for good product. U.S. Open Champion Jerry Pate’s design in Vancleave, Mississippi called, “The Preserve” is one course you won’t want to miss. It’s a proud member of the Audubon International, which means the environment first when sustaining the golf course. One challenge golfers will enjoy is the par 3, 16th hole. It plays 225 yards from the tips, it is also the No.1 handicap hole on the course. Not something you see from par 3 holes just about anywhere in golf. 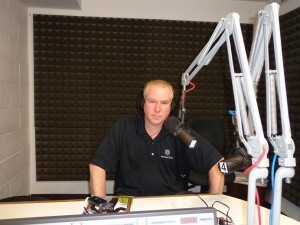 Visit PreserveGC.com or call (228)-386-2500. Grand Bear a signature Jack Nicklaus design in Saucier MS.
No great golf destination is without a golf course from the greatest golfers ever, and that’s the Golden Bear jack Nicklaus. 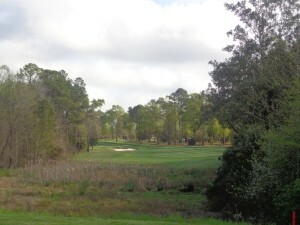 In the Biloxi area that course is the Grand Bear Golf Club. Grand Bear was selected to host one of the pro-am events during tournament week this past week for the visit from the PGA Champions Tour. The view from the parking lot or the 18th fairway as you look at the log cabin style clubhouse is one that will stay with you for a while. But the golf course has plenty of views on it’s golf holes that will also stick with you for a while. 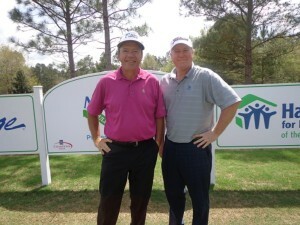 Former Masters Champion Ian Woosnam (L) came out to the pro-am at Grand Bear. Grand Bear has a very enjoyable and relaxing drive into the golf course from the highway. About 6 miles worth of winding roads that start putting your mind at ease for the day, before you even check in. While playing Grand Bear, don’t expect to see what you see around many of the other designs by Nicklaus. Big mansion type homes are no where to be found at Grand Bear, in fact you won’t see any homes at Grand Bear. Enjoy your round in a relaxing environment, you don’t get many like this. For more information on Grand Bear visit Golfgrandbear.com or call the pro shop (228)-539-7806. 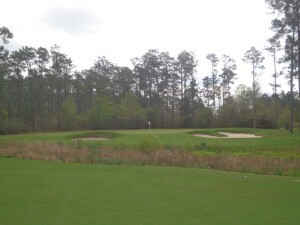 The Par 4, 13th hole at the Tom Fazio designed Fallen Oak GC in Saucier MS. 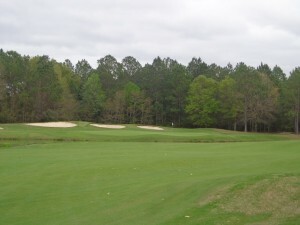 Fallen Oak GC is one of the highest rated golf courses in Mississippi. Scheduled to open just a few weeks after hurricane Katrina hit the area, Katrina pushed back opening day by about a year. The staff lead by general manager David Stinson, who spent some time at Olympia Fields before ending up in Biloxi, will make sure your golf experience is one you will be talking about with your fellow golfers for years to come. Fallen Oak the home course for the PGA Champions Tour visit, is part of the Beau Rivage Hotel and Resort (MGM) family. 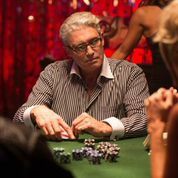 While you do need to be a guest of the resort to play the golf course, you don’t need to be a “high roller” to play. You can take one of the resort limo’s right from the front door of the resort, to the front circle of the club house. The par 3, 17th hole at Fallen Oak. Fallen Oak recently underwent a major bunker renovation. So if it’s been a while since you played the golf course, and had some trouble after hitting your shot in the bunkers. It’s time to come back and visit Fallen Oak again. 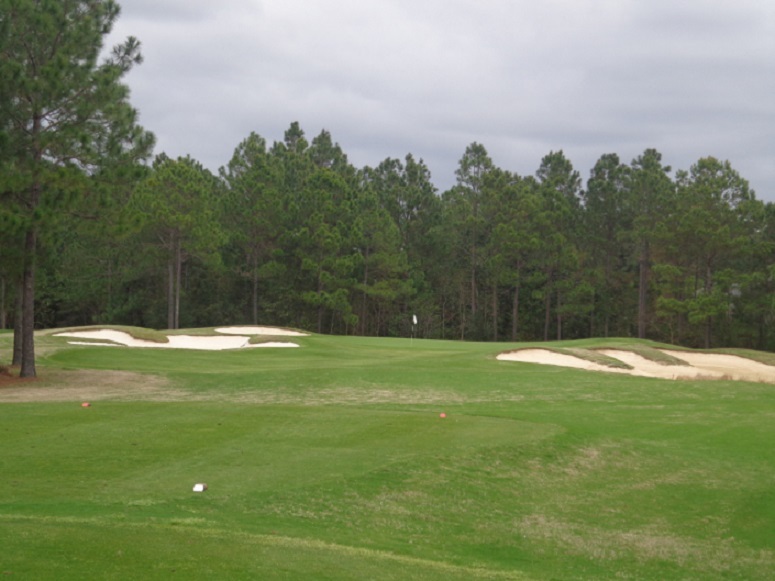 The elevation changes that golfers find at Fallen Oak, are not normally found at courses near the gulf. Fallen Oak offers a full practice area for golfers that need some warm up time before the round, or wish a little more practice after it. The full sized bar has a great view of the 18th hole, and is a comfortable place to enjoy the post-round meal or beverage. The bar is known for making one of the best Bloody Mary’s that you will find anywhere. If you are watching golf today or tomorrow on the Golf Channel, do check out the Mississippi Gulf Resort Classic from Fallen Oak. A good way to see the course in person before making a trip there. Fallen Oak and the Beau Rivage Resort allow you to play where the professionals play. For more information on the course or the hotel and resort. See Beaurivage.com or visit Fallenoak.com, the course highly rated by multiple national publications. Golf in the gulf is something golfers need to explore on their next destination trip. To learn more about all of what Mississippi has to offer, see VisitMississippi.org. THE BEST DEAL IN DUPAGE, Links and Tee’s Golf Dome. With the weather a bit cold for today and the weekend, why not go back inside to get your outdoor golf preparation work done. Spring tune up time, go get your lesson from a member of the professional staff. Call (630)-233-7275 Ext. 4, Visit Addisonparks.org. Links & Tee’s 880 West Lake Street, in Addison. 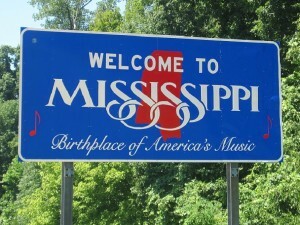 Welcome to Mississippi, the “Birthplace of America’s Music” and by recent viewing a whole lot more. This week is the Champions Tour Event, the Mississippi Gulf Resort Classic. What golfers will find is plenty of great golf to play around the gulf. What Mississippi doesn’t have is a trail of courses done by one great golf architect, (that’s in Alabama for those of you who are confused) but they have a trail of golf courses that are done by several great architects. That list includes Tom Fazio, Bob Cupp, and former tour players who have turned architect like Jack Nicklaus, Arnold Palmer, Davis Love III and Jerry Pate. Not far away from the courses above is a stellar Jerry Pate design called “The Preserve”, a Par 71 course that is built over 245 acres. The tips will not scare away the big hitters at 6,774 yards, but there is plenty of challenge for any golfer at The Preserve. While playing the golf course that is surrounded by over 1,800 acres of a nature conservancy preserve, golfers can relax in an environment that has a peaceful feeling about it. 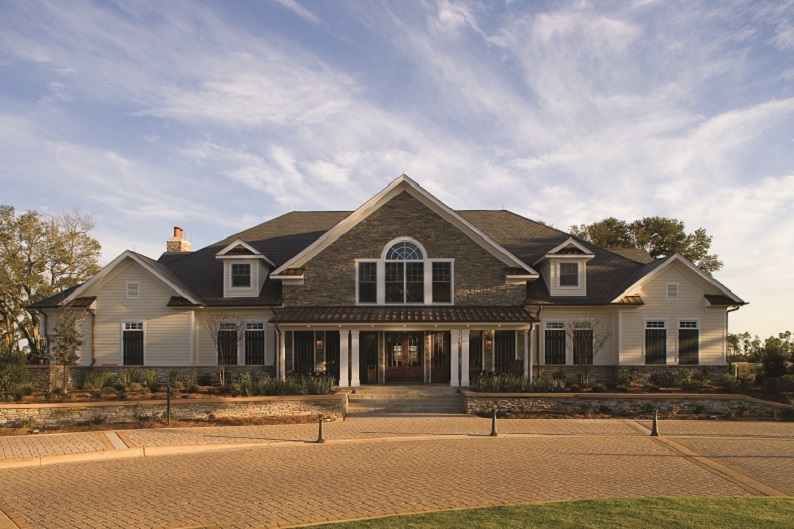 The only house golfers will see is the 8,500 square-foot clubhouse, that has what’s called a “low country” style to it. It’s high ceilings, big windows and covered patio allow for golfers around the clubhouse to view play on the golf course. Inside hardwood floors and chandeliers give the clubhouse a look of style and grace, that says you can relax right here. The Sweetbay Restaurant is more than just a grill or 19th hole. More information is found at PreserveGC.com. or by calling (228)-386-2500. The Bridges an Arnold Palmer design. The Par 3, 16th hole. The Bridges is an Arnold Palmer design golf course. It was created around and through a fair amount of wetland area’s that require bridge crossings, as a result the name Bridges. One of the more interesting features is a sign that warns golfers of both “snakes and alligators” that sticks out of a couple of the ponds located on the course. On a recent visit a gator was spotted on the 10th hole, before it went back into a pond for a swim. Some of the more interesting holes include the first hole, a simple short par 4 that plays right into the hands of the golfer that might slice their opening drive. If do that at the Bridges, no problem you’re fine. Go make a par or better. Closing holes like 16-17-18 require some strategy. The Par 3, 16th isn’t a long hole, but their is some placement to the tee shot. One can bail out out to the right side of the green, but more often that leads to a long birdie putt. The longer carry off the tee is to a left pin placement on the bigger side of the green. 17 is a short Par 4 that is only 283 yards from the tips, big hitters have at it. 18 is a dogleg right that requires landing your tee shot in just the right place. The bunker that guards the turn is a big one, and even if you carry it, the slope behind it can run you down into a water crossing the runs into a pond that is shared by a few holes on the back nine. The golf course is part of the Hollywood Casino in Bay St. Louis. More information on Facebook at GolfTheBridges or by calling (866)-7-Lucky-1. The Par 4, 1st hole dogleg left at Shell Landing. Shelllanding.com. Davis Love III created one of the fun golf courses to play in the gulf area, with his creation of Shell Landing. Love III whose design business had a lot of contributions from former Kemper Lakes head golf professional Bob Spence, show’s off more of the team’s work here. 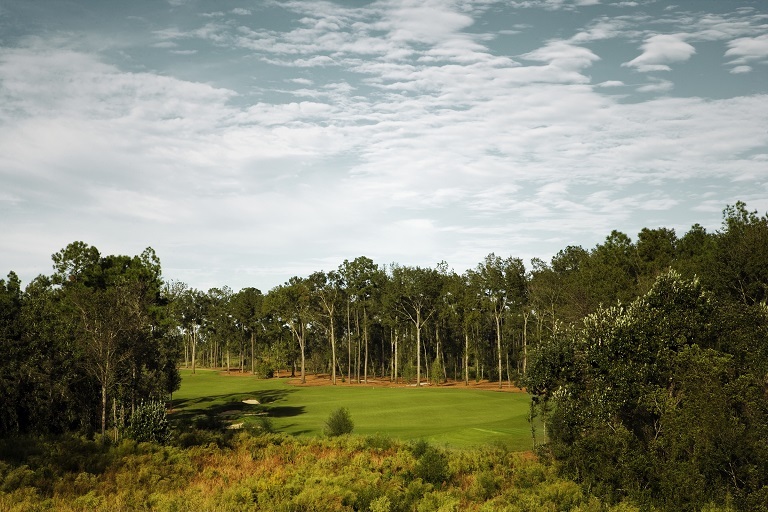 The course is rated highly by several publications, and like The Preserve has more holes that you can play from tee to green without forced carries. 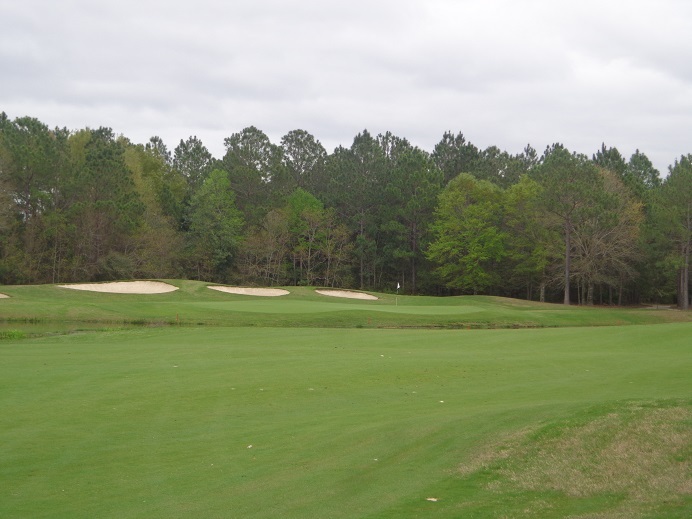 Located in Gautier Mississippi, Shell landing is one course traveling golfers will want to play on their trips to the area. Managing Partner and professional Kenny Hughes and his staff will make sure you enjoy your day at Shell Landing. For information (228)-497-LOVE or Shelllanding.com. Some of the other great golf in the gulf area, includes Grand Bear and Fallen Oak that made up the pro-am circuit for this weeks PGA Champions Tour event. More on them in our two previous pro-am stories and part 2 of Golf in the Gulf, coming soon. Stay clicked in. 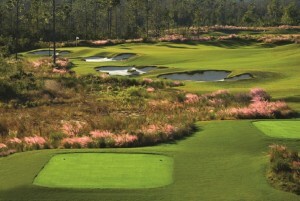 For more on Gulf area golf, you can always visit VisitMississippi.org. LINKS & TEE’S GOLF DOME, The best indoor Deal in DuPage County. Open today until 10 PM. Get that spring tune up lesson now, it will be time to get back outside for golf very soon. 880 West Lake Street in Addison. (630)-233-7275. Ext. 4, or online go visit Addisonparks.org. 7 time winner on the PGA Tour Joey Sindelar and your’s truly on the 9th tee box during the Pro-Am for this weeks champions tour event. 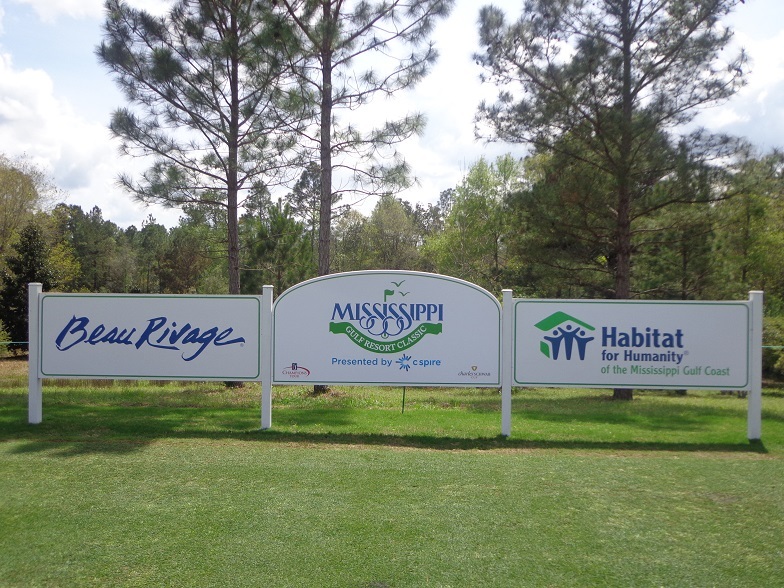 The Mississippi Gulf Resort Classic week is underway, and it’s one of the great weeks here in Biloxi Mississippi. The weeks second pro-am was held on Wednesday at the host site for this weeks tournament, Fallen Oak Golf Club, designed by Tom Fazio. The golf course has recently undergone a renovation to it’s bunkers and the reviews could not be more favorable. From both an amateur’s point of view and from Champions Tour players. 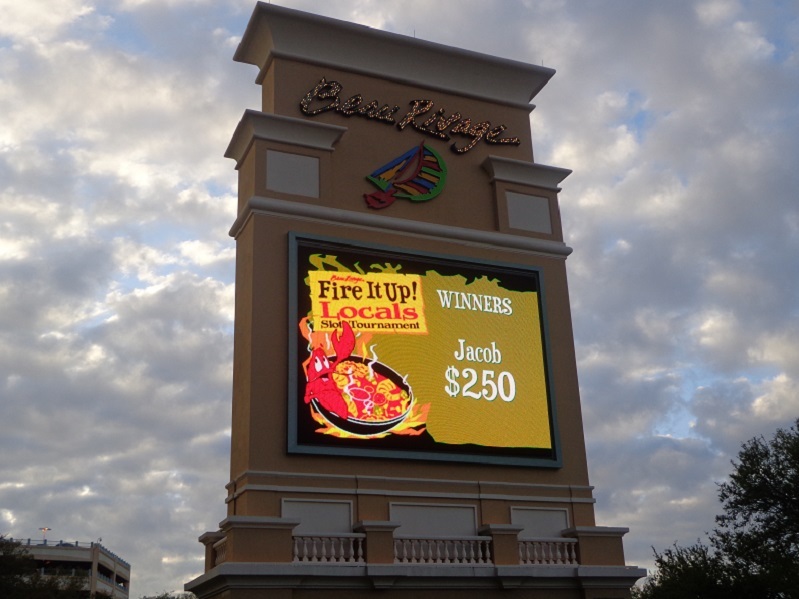 You can bet that guests of the Beau Rivage Resort and Casino who can play the course, will love the new look as well. The pro-am experience here at the tournament like it is at most professional events is a first-class one. Champions Tour players like Joey Sindelar help make it a great day for the amateur partners in his group. Fallen Oak has an interesting history behind it. It was scheduled to open about one month before Hurricane Katrina hit the area, as a result of Katrina the golf course then opened about one year later. Some of the damage took out tree’s, but in the long terms that might have helped the golf course. A little more airflow and sunlight, improved the turf in places that were not coming in as quickly as the design team had wanted. 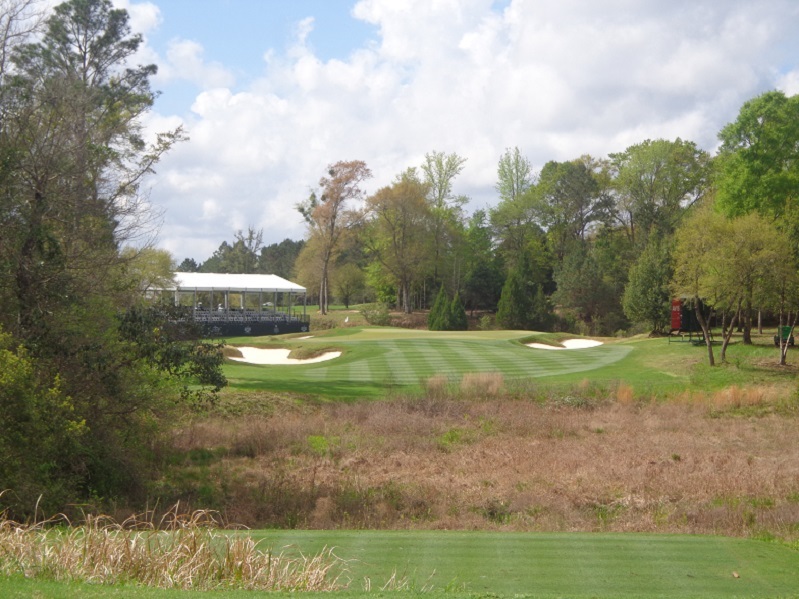 The Par 3 17th, at Fallen Oak will test any golfer, even the Champions Tour players this week. 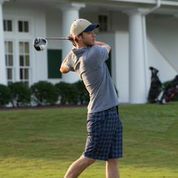 The golf course is located 30 minutes from the hotel, but worth the easy drive it takes to get out to the golf course. The par 72 golf course can play at 7,487 yards, and is built over 510 acres. It has locker rooms for both men and women, the bar area that overlooks the 18th hole is known for one of the great Bloody Mary’s you will ever have. This week when you sit back to watch coverage of the Champions Tour on TV, take a look a great golf course you can play, where the tour players play, Fallen Oak. For more information call (877)-805-4657 or you can visit Fallenoak.com. one can also see Beaurivage.com part of the MGM family of hotels. For more information on Mississippi see Visitmississippi.org. 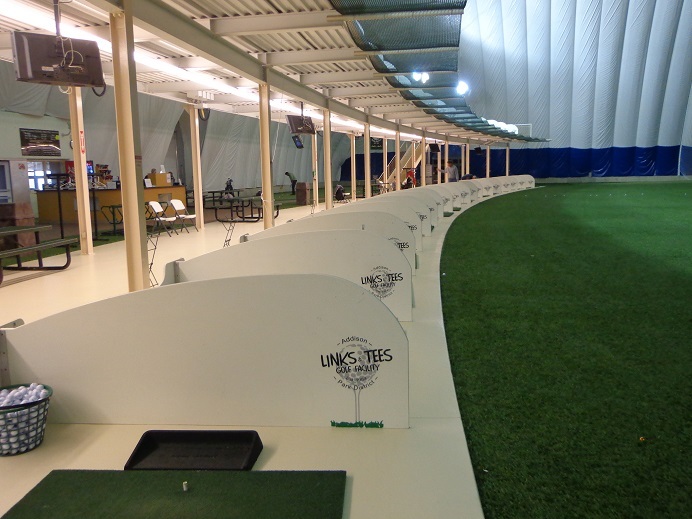 The Best deal in DuPage County, the Links & Tee’s Golf Dome and Faciltiy. 880 West Lake Avenue in Addison. Call (630)-233-7275 Ext. 4, or visit Addison parks.org. WANNA GOLF AWAY…Mississippi is the place to be. The Gog Blog is down south and ducking out of the snow storm at home in Chicago. Biloxi Mississippi is warm, with Gulf breezes, and the sounds of golf shots. The Champions Tour is here this week. 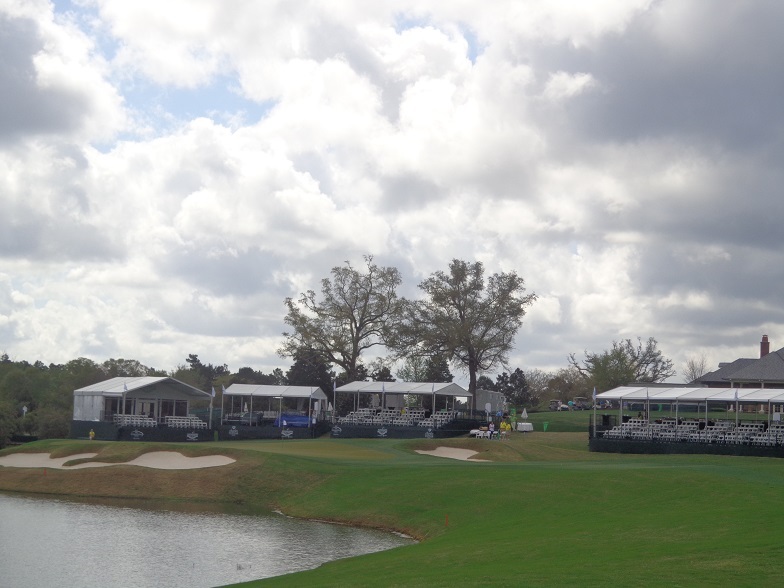 The PGA Champions Tour is here in Biloxi Mississippi this week, and so is the Gog Blog. Tournament week will be well covered once it tee’s off by the networks, but right now it’s pro am time and there are three of them. The first one tee’d off today at the Jack Nicklaus designed Gran Bear Club an outstanding golf course here in the Biloxi area. The second one is Wednesday and the final one is Thursday at the tournament host course at Fallen Oak Golf Club. It was fun to tee it up today with Brian Henninger who was stripping it well, he could be right around the lead this week once the tournament tee’s off. Some of the other names on the course today at the Grand Bear club included the following players. The clubhouse at Grand Bear. 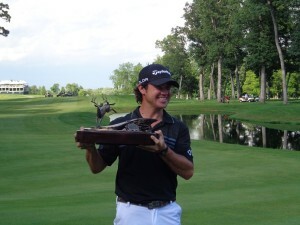 Former Western Open Champion Joe Durant, Illinois Slam winner (with wins at Cog Hill and in the Quad Cities) Scott Hoch, Jim Thorpe, Jay Don Blake, former Masters Champion Ian Woosnam and many others. The winning team in a Shamble format with handicaps, shot 29 under par. Yes you read that right, 29 under par. Okay ! Team Henninger rolled in with 18 under par, and settled for a middle of the pack finish, but a lot of fun was had. Pro-Am’s are a bunch of fun and if you have never done it, try to find a professional tournament where you can. You won’t regret the experience. The Par 5 second hole, 540 yards. The Par 5 second hole plays 540 yards and with a good drive, players can try to get home in two shots. But the bunkers on the back side of the ravine that guard the green, can grab even the biggest of hitters. As some of team Henninger found out today. The Mississippi Gulf Resort Classic week is rolling here in Mississippi, check out the action at Fallen Oak rated highly by more than one national golf publication. The golf course is for guests of the Beau Rivage Casino and Resort Hotel, part of the MGM family. See Beaurivage.com for more information. There is a lot more from Mississippi in the days and weeks ahead, stay clicked in. A golf destination you just have to visit. The award winning Chicago area golf domes. On the left the Buffalo Grove Golf and Fitness Center. On the right the best deal in DuPage County, the Links & Tee’s Golf Dome in Addison. See bgparks.org or Addisonparks.org. Get your spring tune up lesson today. BY: Rory Spears, Editor & Director of Content. Follow Rory on Facebook, Linked & Twitter @GogBlogGuy. Do you need a fix from a charity donation, the right now bid on chance to win great items from the PGA Tour’s event the John Deere Classic. There are two things you can bid on right now and you can bid on them via charitybuzz.com. All proceeds benefit Birdies for Charity. There first lot is autographed memorabilia from Jordan Speith, the bidding stops at 3 PM on March 26th EDT, this Thursday. 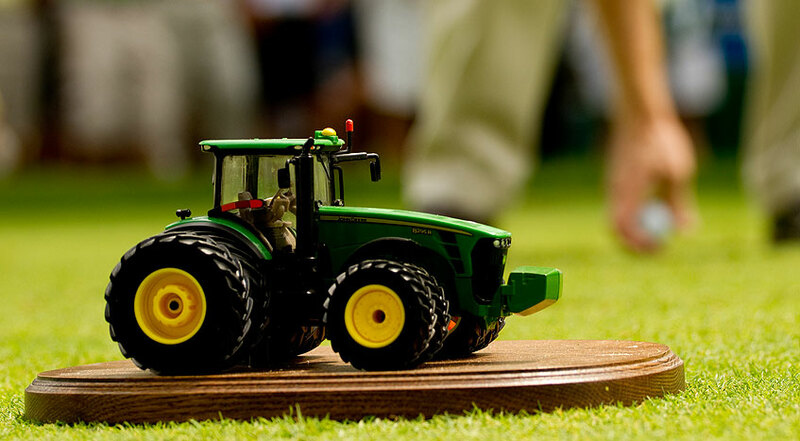 The best tee-markers in golf, the John Deere Classic tractors are up for bid and signed by defending champion Brian Harmon. You can bid on the tractors through Tuesday March 31st, at 4 PM EST. Bid now, on lots autographed by the winners. Benefits Birdies for Charities. 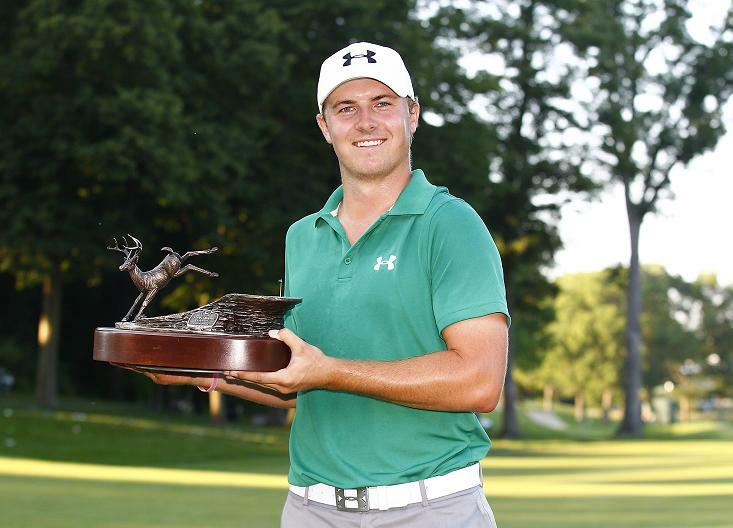 The 2015 John Deere Classic is July 6-12, at TPC Deere Run. Links & Tee’s Golf Facility Lake Street in Addison, Buffalo Grove Golf & Sports Center McHenry Road in Buffalo Grove. Chicago’s Award winning golf domes. Check them out. BY: Rory Spears, Editor and Director of Content. Follow Rory on Facebook, Linkedin & Twitter @GogBlogGuy. Rory McIlroy is halfway to a “Rory Slam”, can he pull it off with wins at the Masters and U.S. Open in 2015. 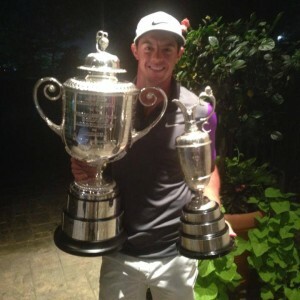 Rory McIlroy is the World’s No.1 golfer,we will hear a lot from him on and off the golf course for years to come. McIlroy has won four majors and should win a few more before it’s all done. With a win at Augusta in the Masters, McIlroy will complete the career Grand Slam. With all the focus starting to come onto his shoulders, McIlroy used this weeks Arnold Palmer Bay Hill Championship to be his final Masters tune up. Prior to round 1, McIlroy held his weekly press conference to catch everyone up on the state of his game, Augusta prep and more. Click here to hear Rory McIlroy’s press conference. Enjoy the final round of the Arnold Palmer Invitational on TV this afternoon. The Best Deal in DuPage, Links & Tee’s golf Dome and Facility. Open today from 7 Am to 11 Pm, with rates starting at $14 for 30 minutes, just $10 after 7 pm. Time for the spring tune up, go see the professional staff. Call (630)-233-7275 Ext. 4 or visit online Addisonparks.org. 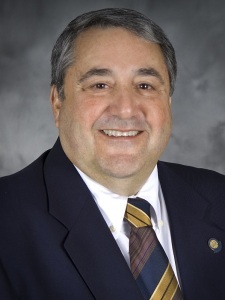 The Illinois PGA Section is losing it’s Executive Director Michael Miller who resigned on Friday, to assume the same position for the Southwest PGA Section (Arizona). The IPGA section was made aware of Millers decision on Friday, by section president Jim Opp. Opp said that after speaking with Miller, Millers decision was a difficult one for him for him to make. Opp said he wished Miller and Miller’s wife Lisa the best, as they will start the next chapter of their lives. Miller had been the IPGA section’s Executive Director for over 20 years, and was entering his 27th year of service with the IPGA. Miller will begin his new job in Arizona on May 1st. Both Miller and Opp were unavailable for comment on Friday night as the news broke. Miller was believed to be in route to Arizona, to meet with Southwest Section officials and professionals. Opp told the Illinois section professionals that the IPGA board, will do everything it can to make the transition as smooth as possible. Opp said there is no rush to name a replacement and the process could be a long one. He also welcomed input from section members to contribute to the selection process. Opp said that section members would be kept updated on progress during the search for Millers successor. 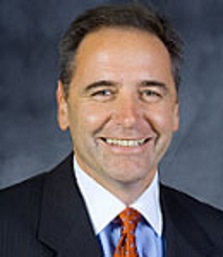 IPGA Section President Jim Opp. 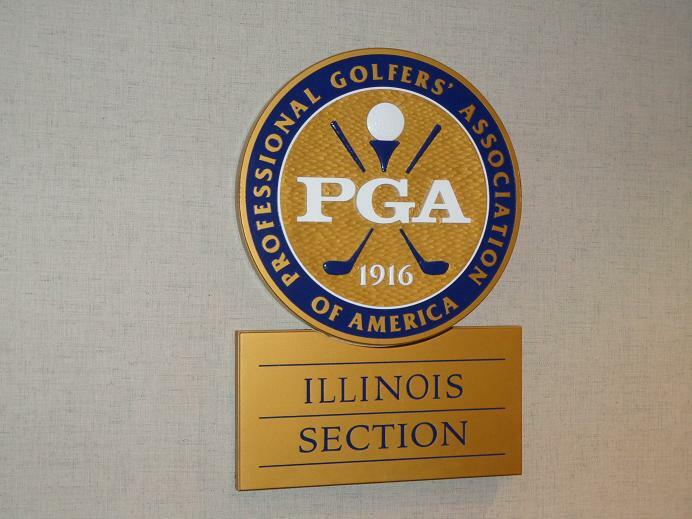 The Illinois PGA office had been one of little or no change for the past eight years. Miller departure is now third front office staffer to leave since last fall. Tournament Director Jared Nowak and Director of Member and Partnership Services Lauren Moy both resigned in fall of 2014. There is no confirmation yet, if any other IPGA staff members will leave to join Miller In Arizona. To follow the Illinois PGA Section and it’s championships and events, please visit online IPGA.com.